This entry was posted in CALIBISHIE CHAPEL, Dominica's National Shrine, EASTER PILGRIMAGE 2018, MASSACRE CHURCH, Massacre church, Our Lady of La Salette, Our Lady of La Salette shrine, Pointe Michel church, PORTSMOUTH CHURCH, renovation works at Dominica's National Shrine at Pointe Michel church after the fire in July 2016, Soufriere church, The National Shrine's roof on January 10, 2019 by Bernard Lauwyck. 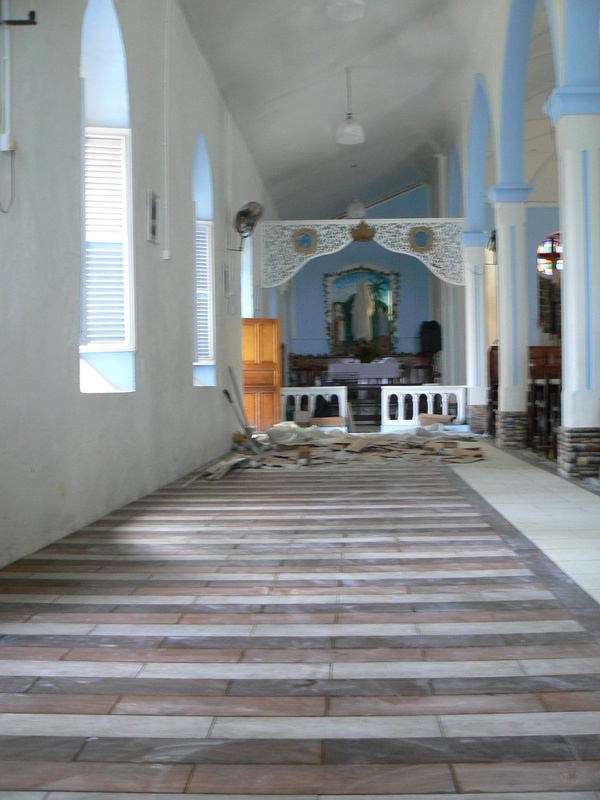 This entry was posted in Pointe Michel church, renovation works at Dominica's National Shrine at Pointe Michel church after the fire in July 2016, The National Shrine's roof, Upgrading of Liturgical spaces and tagged catholic, Dominica, Holy, liturgical space, National Shrine in Dominica, Our Lady of La Salette, Place of Worship, St Luke parish church on December 20, 2016 by Bernard Lauwyck. This entry was posted in buildings in progress, Dominica's National Shrine, Our Lady of La Salette, Our Lady of La Salette shrine, Pointe Michel church, renovation works at Dominica's National Shrine at Pointe Michel church after the fire in July 2016 and tagged catholic, Diocese of Roseau, Dominica churches, Dominica's national Shrine, National Shrine Dominica, Our Lady of La Salette, Pointe Michel Catholic church after the fire, Pointe Michel church on September 23, 2016 by Bernard Lauwyck. This entry was posted in Dominica's National Shrine, Our Lady of La Salette, Our Lady of La Salette shrine, Pointe Michel church and tagged Diocese of Roseau, Dominica churches, Dominica's national Shrine, National Shrine Dominica, Our Lady of La Salette, Pointe Michel church on August 7, 2016 by Bernard Lauwyck. 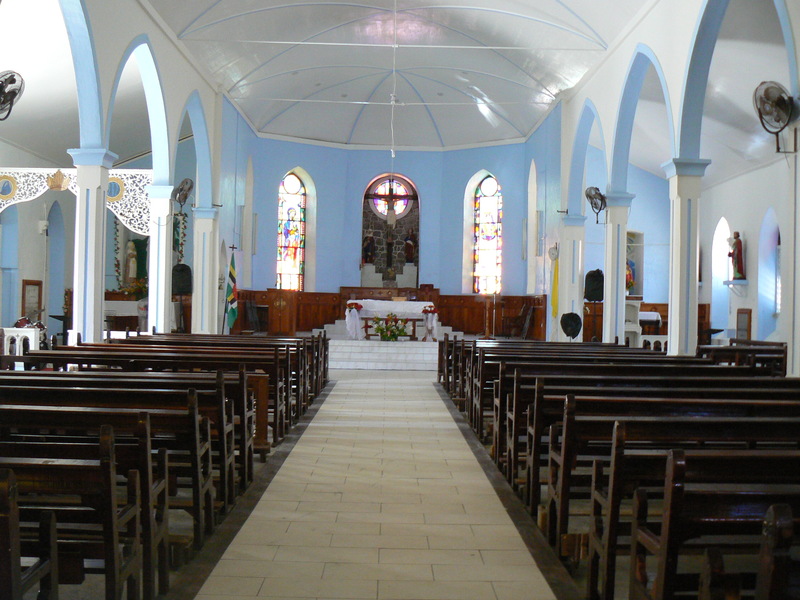 In August 2014 part 1 of the history of Dominica’s National Shrine was published in OUR CATHOLIC COMMUNITY . Today I want to write about the recent history of the National Shrine in Dominica. 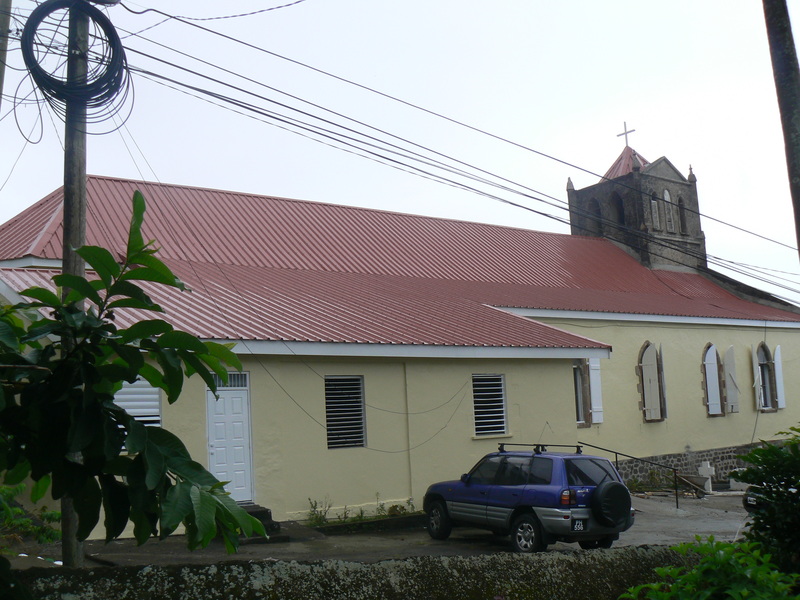 The renovation works on the Pointe Michel church were initiated by monsignor Reginald LaFleur in 2009. His aim was to upgrade the church to be a worthy and outstanding place of worship, which would encourage prayer and pilgrimages. 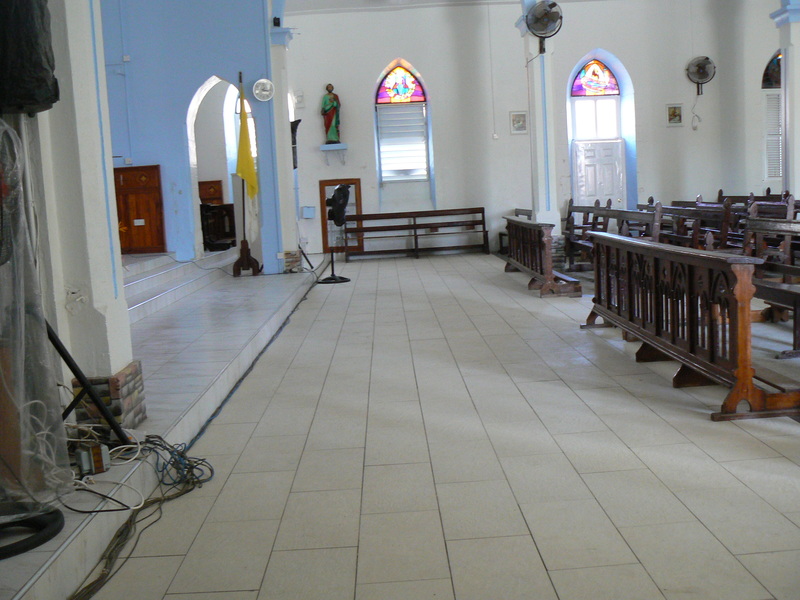 Monsignor Reginald La Fleur was of the opinion that fundraising for the renovation of the church was bogged down as people did not see anything happening after many years of raising funds. He felt that the roof renovation works should be preceded by some smaller works of enhancement and beauty which could be completed in a very short time. These small achievements would then re-energize the fundraising for the roof replacement. While this seemed to many at the time to put the cart in front of the horse, this strategy and vision bore fruits as we will see below. 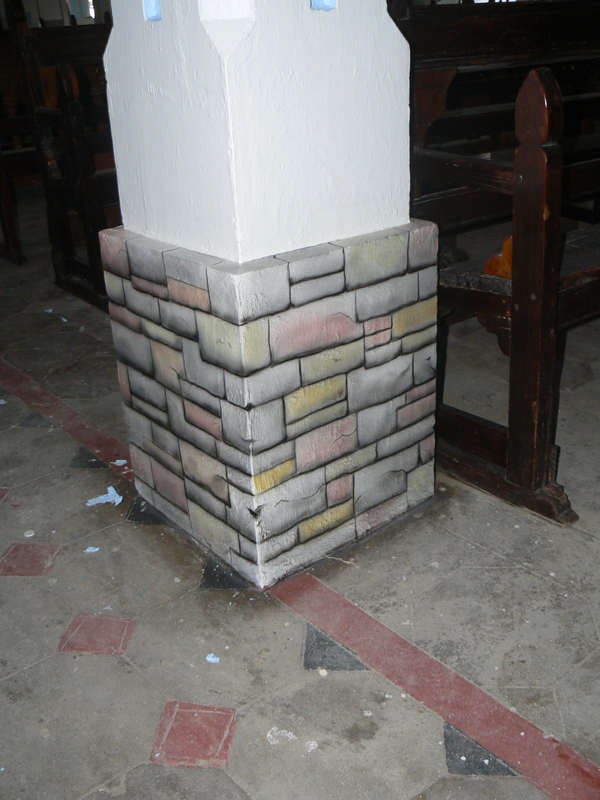 But before any construction work on a church is started much work needs to be done with the “LIVING STONES OF THE CHURCH” : the parishioners need to be sensitized, consulted and motivated. They need to be able to visualize in their minds what improvements are proposed and understand the liturgical reasons why these are proposed. In March 2009, I presented to the church committee a PowerPoint plan of action . This presentation was based on the latest liturgical guidelines and aimed to inspire and open minds to beautiful, yet meaningful and religious symbolic improvements. It was very much inspired by Pope Benedict’s post-synodal apostolic exhortation which stressed “the profound connection between beauty and liturgy”. The proposal was to concentrate on the beautification of the sanctuary and shrine. This could be achieved by installing new floor tiles and beautiful wall panelling . Also by designing and manufacturing beautiful furnishings such as a new AMBO, which should be a dignified place to proclaim the Word of God and a celebrant’s CHAIR as he represents Christ presiding over the liturgy. The proposal included the highlighting of the shrine of Our Lady of La Salette by colouring the statues . The presentation was also displayed on plywood boards at the back of the church for everybody to see. Norms regarding a National Shrine state that the shrine should be accessible for all. This meant that a wheel chair ramp had to be constructed. Following the acceptance of these proposals came the choice and procurement of materials. It took quite some time to find the right tiles for the sanctuary. Parishioners got the Forestry Division to provide them with local Red Cedar boards, which had to dry for about six months. My design of the cedar panelling and ambo included several quatrefoils, a religious symbol representing the four evangelists. The placing of the floor tiles and preparing and installation of the varnished Red Cedar panelling started in July 2010. After these were completed the sanctuary was repainted and new light fixtures installed. The final touch was a beautiful new Ambo. All this was completed before the September 2010 La Salette Feast. When Fr. 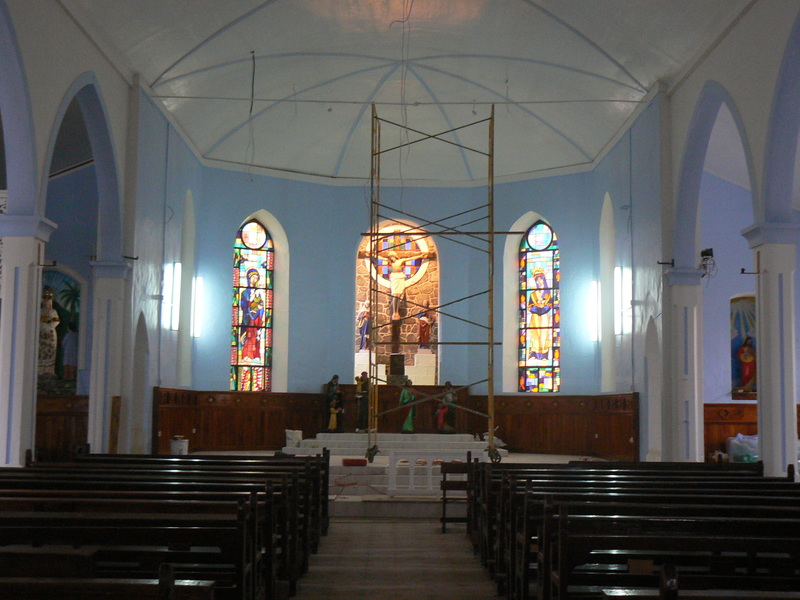 Peter Wamutitu became parish priest in 2011, he vowed to continue the renovation works. He had the support of a committed parish council and fundraising committee . Engineer Kendell Johnson, a parishioner, prepared an estimate for the roof and ceiling replacement on September 24, 2011 with a total estimate of EC $ 458,600.00 . While this seemed beyond the means of the parish, a fund raising drive started in earnest. People had faith ! In the meantime, small achievable steps were taken towards the completion of the project: additional Red Cedar paneling and altars were installed in 2011 in the La Salette Shrine and the Sacred Heart alcove by Marshall Cuffy. Next was the removal of the ceiling, which contained asbestos fibre-cement panels. With the experience gained from similar works at the Roseau Cathedral, this was done professionally and environmentally friendly in August 2012. Fundraising, both local and overseas, continued unabated under the leadership of Ms. Carol Activille. This was done in so many small ways. For example Mrs. Frances Casimir told me that she and a few friends have been selling coffee after Sunday Mass for the last eight years to raise funds for the project. Parishioners contributed in any way possible, small or big. There were also substantial donations from individuals and organisations: Propagation of the Faith, one of the five Pontifical Mission Societies in Rome, and German Catholics through Adveniat in Germany provided substantial funds . The roof removal and replacement works were put to tender and three contractors responded. Stevo Construction was the lowest bidder and got the job. The roof renovation works were started in January 2014 and were completed by May 2014. Stevenson Joseph and his team also constructed the new ceiling based on a design by Kendall Johnson. The painting works were done by Germaine Etienne. The electrical installation by Adams Hidges. The artful painting such as the imitation stonework on the pillars was executed by Caesar Catin. All this was completed just in time for the La Salette Feast in September 2014. 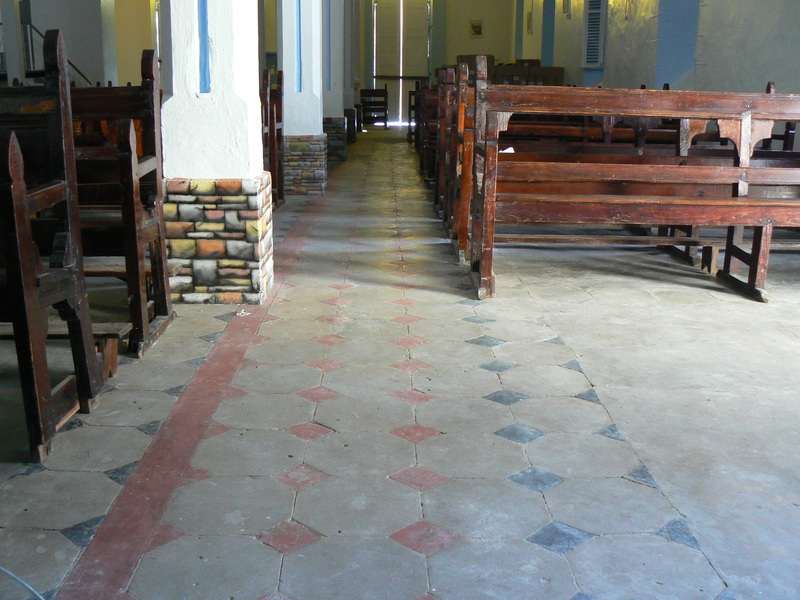 The most recent works were the tiling of the nave, made possible by a donation of tiles by FOOD FOR THE POOR (USA). The work was done by Francis Daisy and his team in July/August 2015. Beautiful brass chandeliers were also installed. Guidelines tell us that a National Shrine should be a worthy and exemplary space for Liturgy, a place of beauty. I think that Dominica’s National Shrine already fits this description although some more work has to be done. 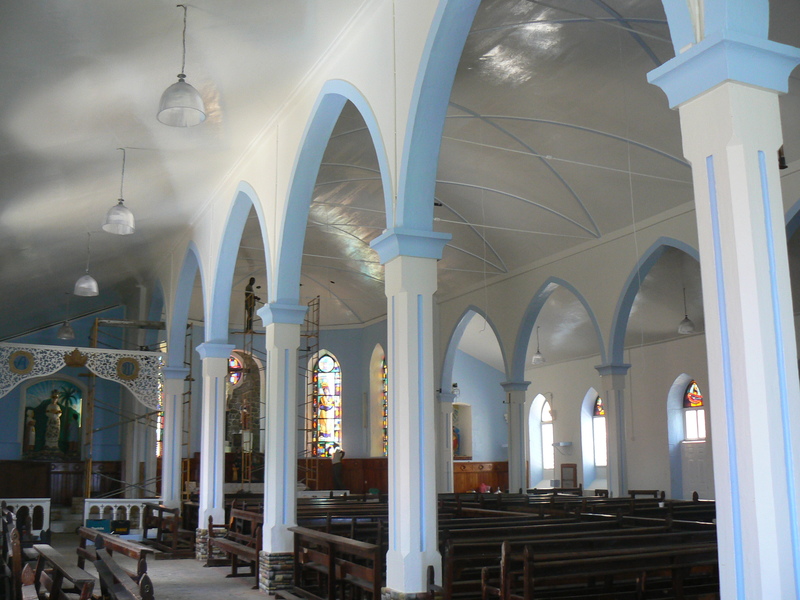 This entry was posted in Dominica's National Shrine, OLD CHURCHES and CHAPELS, Our Lady of La Salette, Our Lady of La Salette shrine, Pointe Michel church, RENOVATED CHURCHES, Upgrading of Liturgical spaces and tagged Dominica's national Shrine, liturgical space, National Shrine Dominica, Place of Worship, Pointe Michel church on January 17, 2016 by Bernard Lauwyck. The Sanctuary was tiled by Monsignor Reginald LaFleur in 2010. Now, the tiling of the entire nave has been made possible by a tiles donation of FOOD FOR THE POOR (USA) and the initiative of the present parish priest Fr. Peter Wamutitu. The work is done by contractor Francis Daisy. This entry was posted in Dominica's National Shrine, Pointe Michel church and tagged Dominica's national Shrine, National Shrine Dominica, Pointe Michel church on August 26, 2015 by Bernard Lauwyck. It is my pleasure to present you with some photographs of the finishing works. With the changing of the colour scheme, this becomes a complete different Place of Worship. So far more than $ 435,000.00 has been spent on the renovation, which started with the removal of Asbestos in August 2012. This entry was posted in buildings in progress, Dominica's National Shrine, OLD CHURCHES and CHAPELS, Our Lady of La Salette, Our Lady of La Salette shrine, Pointe Michel church, RENOVATED CHURCHES, Sunday Mass at 7 am, The National Shrine's roof, Upgrading of Liturgical spaces and tagged Diocese of Roseau, Dominica, Dominica churches, Dominica's national Shrine, National Shrine Dominica, Our Lady of La Salette, Place of Worship on August 31, 2014 by Bernard Lauwyck.